When you begin to learn a new skill or take on a fresh task, having the proper preparation is necessary. It is important that you have all the vital tools necessary to accomplish your task. When done correctly, you stand a better chance of not wasting valuable money or time. What you need is something that is equivalent to a map. A tool to help guide you and keep you from straying off course. Learning Portuguese isn’t a long road trip to a never before seen landmark. However, the task can be one that is challenging. Making sure that you have the best Portuguese course for yourself isn’t an easy task. Choosing the right textbook can be just as hard as finding the right course. What should you do as a beginner to learn Portuguese? How you start your journey to learn Portuguese will have a direct effect on your overall journey. There is nothing to be afraid of or intimidated by. The list provided below will be a guide to help you find the best route for you as you learn Portuguese. Here are some wonderful resources that will aid you in speaking fluent Portuguese. There are two different variations of Portuguese that are most commonly known. The two different types include Brazilian Portuguese and European Portuguese. Between the two there are variations in accents, vocabulary, and pronunciation. Consider what is most important to you. Here is an easy way to learn the basics of Portuguese. Included in this course is a blend of both European and Brazilian Portuguese. Each of the vocabulary lists is categorized according to different themes. This allows you the ability to study your vocabulary in groups. Learn animals, foods, clothing, greetings and so much more within each category. There is audio included with each vocabulary list to help you learn the correct pronunciation of all the words. There are also lessons in grammar to help you understand the gender of words, the conjugation of verbs, pronouns and more. Babbel is a program that is designed for those wanting to start immediately to learn Brazilian Portuguese. There are many courses within this program that are constructed in levels. You get to start at the basics and work your way through higher levels of understanding as your Portuguese develops. All of the provided information is in an order that is logical for beginner learners. The course available to beginners offers convenient features that allow for the practice of pronunciation, activities for listening, exercises that include the translation of words along with many other practice tools. For individuals who love to be entertained while learning, FluentU combines education with entertainment to create an exciting environment for learning Portuguese. The FluentU platform showcases real-life educational videos. The videos may include movie trailers, music videos or clips from the news. All of the learning videos have captions that are annotated. As a result, you have access to the definitions of all of the words. Along with this, there are example sentences provided and an image to reference. You also have the ability to click on any word and be taken to another video that also uses that same word. Quizzes are provided to test your knowledge of the language. No matter what level you are on as you learn this new language, there is a lot available through the FluentU platform to guide you in learning Portuguese. Memrise is a program that will teach you both Brazilian and European Portuguese. Within this program, there are two distinct courses available. One specializes in European Portuguese and the other caters solely to Brazilian Portuguese. Both of these courses are structured to teach the same material. The advantage allows you the ability to view both courses simultaneously and understand the differences and similarities between the two. As you begin, you will learn the basics which include vocabulary for food and various greetings. This program offers a basic start to help you get familiar with both versions of the Portuguese language. This is a free website that highlights common rules and common terms that can be found in both styles of Portuguese. You will find special notes for words that differ in meaning. All of the basics of Portuguese can be learned here. These basics include rules for pronunciation, the alphabet, some beginner vocabulary and rules for grammar. There are a variety of resources that are available to you for free on this platform. This platform is very helpful for beginner learners of Brazilian Portuguese. You are provided with a list of the most common words. With each list, you are given multiple activities that are related to the vocabulary list. There are flashcards, matching games and tests available for you to take as you progress. To put it all into context, there are example sentences provided. As you begin to pronounce each word, you will find audio examples to help. Other resources available on this platform include cooking lessons, audiobooks, lessons in grammar, lessons for beginners, common phrases and more. For those who love to watch videos, you can learn Portuguese by simply watching YouTube. You will find basic teachings for Brazilian Portuguese words and phrases in this video. As you watch, you will see on the screen both English and Portuguese words to help you understand what the speaker is saying. The speaker will say the words twice in Portuguese at a normal rate followed by a slower pace so that the listener can hear the pronunciation of each word properly. Within this video, there are 500 words and phrases to help you learn basic questions, common greetings, and phrases. It is encouraged that you remain focused throughout the entire 53-minute long video. However, you can also play the video when you are accomplishing other important tasks. These tasks may include cooking, bathing or falling asleep. This is a simple workbook crafted to help you learn Portuguese. It is organized for your learning convenience. European Portuguese is the main focus of this workbook. However, Brazilian Portuguese is often referenced throughout. The overall workbook is divided into small lessons that focus on vocabulary and basic rules for grammar. This particular book is limited to the present tense. 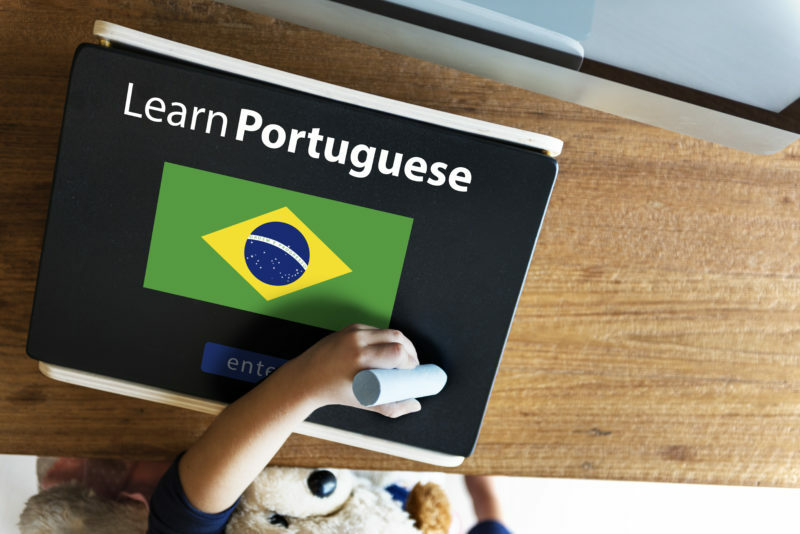 These eight resources are available to you as guides in learning the Portuguese language. As you embark on your own personal journey, remember to find a learning pace that works for you.